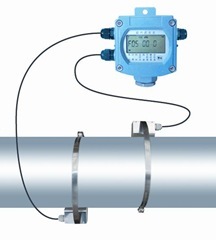 The clamp on ultrasonic water meter is battery powered ultrasonic water meter and developed from transit time clamp on ultrasonic flow meters and used for water flow measurement.Because ultrasonic water meter carries on many good features from ultrasonic flow meter,such as no moving parts,no pressure drop,versatile communication protocol,etc, meanwhile with IP68 protection class, the clamp on ultrasonic water meter will be a better choice for non-invasive water flow test. Clamp on ultrasonic water meter mainly has two parts: one is clamp on transducers,the other is main electronic converter. The clamp on sensors are IP68 class and the main electronic part is housed in a IP68 metal enclosure. Both of them is connected by special cable. Clamp on transducers are installed outside of the pipe and don’t need to cut pipe, thus, there is no pressure drop,no risk of leakage,no maintainance,etc. As clamp on water meter is battery powered,its accuracy level can’t reach that of main powered clamp on ultrasonic water flow meters.Thus,battery powered clamp-on ultrasonic water meter is mainly for water flow reading, but not for trade checkout. If need higher accuracy, we recommend main powered ultrasonic flow meter or battery powered ultrasonic water meter with insertion type sensor or inline type sensor.Though clamp-on ultrasonic water meter is not perfect at present stage, it is still a very promising water flow meter. It is a very hard point to develop battery powered clamp on ultrasonic water meter. But we will continue to improve it. As development of electronic technology, battery powered clamp on water meter will have a better performance in the future. 3. Fluid temperature: 0-150 Deg.C. 4. Battery: 3.6v 19AH built-in battery can work for 3-4 years. DC8-36V optional. 9. Working temperature: -10-70 Deg.C. 11.Keypad and operation: local keys for windows browsing, RS485 remote keypad for setting, free setting software is available,too.